Pennsylvania has four categories of slot machine licenses. Pennsylvania’s lottery sales have taken a dip recently, but new legislation could soon bring more gaming revenue to the state. On October 30, 2017, House Bill 271 was signed into law as Act 42, an amendment to the Pennsylvania Race Horse Development and Gaming Act. The bill legalizes online gambling and daily fantasy sports in Pennsylvania. Category 1: Racetrack, also known as a “Racino,” is a combination race track and casino that may have up to 250 game tables and 5,000 slot machines. Category 2: Stand-alone casinos are allowed up to 250 table games and 5,000 slot machines. They may also offer resort amenities such as entertainment, restaurants, and spas. Category 3: Resort casinos are allowed up to 600 slot machines and 50 game tables, and are attached to hotels. Only guests or “members” are allowed to gamble at resort casinos. Category 4: Casinos that allow 300 to 750 slot machines and up to 40 table games. The Pennsylvania Gaming Control Board oversees the state’s casino industry, along with the new gaming platforms allowed with HB271. Online lotteries, interactive gaming, video gaming terminals at truck stops, tablet gaming at airports, fantasy sports contests, and ancillary slot machine facilities are expected to appeal to new, younger players. Many games can be played on mobile devices, and monitor-based games intended for bars allow participants to watch a simulated sports event. While it remains a much-debated topic, the state expects the new law will help generate around $150 million in revenue. HB271 creates an auction system to auction off 10 available Category 4 slot machine licenses and establishes an exclusive 15-mile radius in which winning bidders can operate. Winning bidders must then apply for a Category 4 license. At least one week before an auction, bidders must submit a surety bond or letter of credit for $7.5 million. The bond proves the financial ability to pay the slot machine license fee if they receive a license. The license fee will be the amount of the winning bid, and no bid may be lower than $7.5 million. The auction process establishes the order the winning bidders select a location for their casino. Once awarded the bid, the winner must pay the bid price within two days, and then has six months to submit an application for the license. 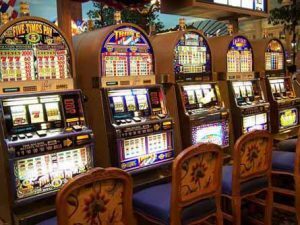 The license allows the winning bidder to operate between 300 and 750 slot machines. They could also petition to add up to 30 table games for an additional $2.5 million fee and add 10 more table games after one year of operation. Applicants for Category 1 or 2 slot machine licenses must post a letter of credit or a surety bond for $50 million, and applicants for a Category 3 slot machine license must obtain a letter of credit or a surety bond for $5 million. Before any category of slot machine license is issued, applicants must obtain a surety bond of no less than $1 million. The bond ensures that the licensee makes payments, keeps books and records, makes reports, and conducts operations in compliance with the rules and regulations of the Board. The House bill also provides for licensing of fantasy contests. Applicants must pay an application fee of $50,000 and maintain a reserve of funds in the form of a security: cash, cash equivalents, or a security deposit held by a bank and/or processors, or an irrevocable letter of credit, payment processor reserves and receivables, a surety bond, or a combination of several forms of securities. SuretyGroup.com is qualified to write fantasy contest surety bonds in Pennsylvania. Surety Bonds must be purchased from an agency that is licensed to write bonds in Pennsylvania. SuretyGroup.com fulfills the agency requirement and offers free, no-obligation quotes for all surety bonds. Contact our Surety Bond Specialists to get started. Call 844-432-6637 or email info@suretygroup.com.